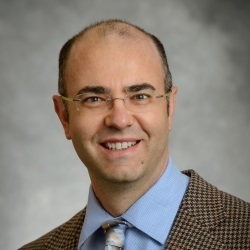 Dr. Pellegrino serves as the curriculum architect for the AS and BS Health Sciences program, founded on the engagement of students working with faculty and professional colleagues across health professions the historical Aultman advantage. He brings 25+ years of community health and emergency preparedness experience to bear in his daily work at the college while integrating several facets of that work with service to national and international organizations dedicated to personal and community health. His scholarship of application has led to co-authoring national and international first aid and resuscitation guidelines, most recently the 2015 American Heart Association and American Red Cross First Aid Guidelines and the 2016 International Red Cross and Red Crescent guidelines. Through his leadership of the Survival Behaviors Lab, he researches lay rescuer education and experiences, using a Community Participatory Research approach. Dr. Pellegrino is a sought-out subject matter expert by popular media in preparing self, family, and communities for emergency response. He has appeared on the Weather Channel, newspapers like the Wall Street Journal & New York Times, podcasts, magazines like Men’s Health & Good Housekeeping, and websites. To maintain his clinical skills, he serves as an firefighter/ EMT in the City of Hudson. Jeffrey continues to volunteer on the International Consensus on Science and Treatment Recommendations (ILCOR)[hyperlink] and the national Science Advisory Council of the American Red Cross, where he chairs the Education Committee. He also is a member of the Ohio EMS Education Committee and is the editor in chief of the International Journal of First Aid Education. He has been recognized for his service and leadership as an International Master First Aid Educator, Trainer; Clara Barton Society member; and Silver Beaver Award recipient. Although busy, he finds great reward in watching his 11- and 15-year old daughters dabble in questions of the body and health while participating with him in different community activities.